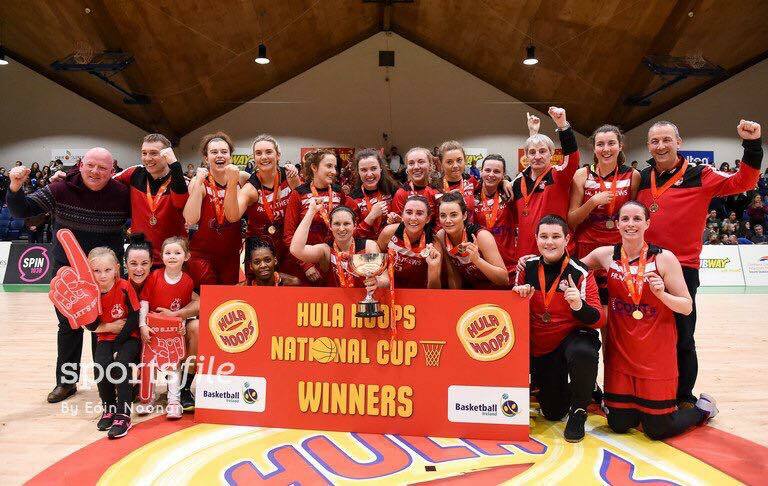 Fr Mathews stormed home to their first ever Senior Women’s National Cup title at the National Basketball Arena in Tallaght, with a 55-45 point win over Meteors in the big decider. A Niamh Dwyer-inspired comeback at the very end of the third quarter saw her side make an 18-point turnaround. “This is absolutely massive for the club to win our first title. We had two bus-loads come up to make sure we had the support,“ said a delighted Niamh Dwyer. The first quarter saw scores at a premium as both teams took some time to find a rhythm as the turnovers were high and the scores were low. Nevertheless, they still managed to supply the large and noisy crowd with an edge of the seat game. Meteors were the ones to get first off the mark early on, and when Eimear Mairtin knocked down a long range shot minutes later, they had opened up an 8-2 lead. Fr Mathews were under pressure to keep the gap from going to double figures but an stand-out display from Emma Gallagher saw her respond with a big three of her own. This injection of life was needed and Fr Mathews’ Ashley Cunningham followed up with a block and quick pass to Hollie Herilhy driving to the basket to bring it back to a two-point game. Meteors quickly responded with scores of their own but a three-pointer from Olivia Dupuy saw the game turnaround in the space of 36 seconds from a seven points deficit, to just one. The second quarter started with the same fierceness with Gallagher supplying a masterclass in shooting. It wasn’t until the final minutes of the third, as Meteors started to build an eight-point lead that the Niamh Dwyer fire power really shone through. The combination of Dwyer and Gallagher gave Igor Petrovich’s side slim pickings as the duo worked hard defensively and Niamh began to attack the basket aggressively to get some vital scores for her team. The final blow to Meteors came from a behind the head pass from Dwyer to Herlihy who made her way to the basket stretching the gap to 10 points. It was too much of an ask for Meteors to come back from and Fr Mathews ran out winners.